The BFI and Nicolas Winding Refn (celebrated director of the Pusher trilogy, Bronson and Drive) have joined forces to bring Nightbirds (1970) – the 'lost' film by New York underground filmmaker Andy Milligan (1929-1991) – to DVD and Blu-ray. Previously seen by no more than a handful of people in a print shorn of five minutes' worth of footage, the film was shot on location in the Spitalfields area of East London in 1968 and never given a significant release anywhere in the world. Newly mastered from the original 16mm camera element under Nicolas Winding Refn's supervision, Nightbirds is finally being released in May in a Dual Format Edition on the BFI's acclaimed Flipside label. This much anticipated release also contains Milligan's British-shot horror feature The Body Beneath (1970), original trailers, an audio commentary and an extensive booklet. While living rough on the streets of London's East End, a young man, Dink (Milligan regular Berwick Kaler – Coronation Street, Red Riding), encounters the beautiful and mysterious Dee (Julie Shaw – The Big Switch). Concerned for Dink's welfare, she invites him to stay with her. The two soon develop a curious relationship which oscillates, often without warning, between sexual intimacy and raging jealousy. As tenderness gives way to cruelty, they become consumed by darkness and their relationship spirals out of control. Milligan aficionados have long considered Nightbirds to be a lost film, and the preparation involved in this release has been subject to a number of problems and adventures involving tracking down rare and unique film materials. Fascinated by Milligan's work since he was young, Nicolas Winding Refn has spent years buying up any Milligan-related items on eBay. 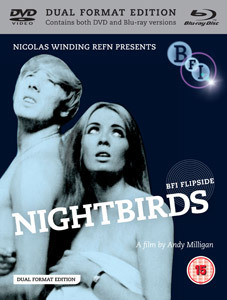 When he found that Milligan biographer Jimmy McDonough was selling his collection of the director's own film prints he bought the lot and, as a long-time fan of BFI Flipside titles, approached the BFI to suggest that Nightbirds and The Body Beneath be included on the label. With Milligan's own print materials missing some scenes, the BFI has been on a journey much like an archaeological dig to find other elements from which to assemble the most complete and authentic presentations possible. Nicolas Winding Refn comments: "...when you watch an Andy Milligan movie you're in no doubt whose film you're watching. It's a special quality to have a unique personal style. He was sort of a Douglas Sirk figure: there's so much subtext in his movies, what you're seeing is not all that's going on. First time perception is one thing, but when you get into them, and read more, you begin to realise that these films were made by someone who was very tormented, and also very intelligent, a sensitive man who used film as an art form to express his views on life." Newcastle-born Berwick Kaler who plays Dink is nowadays best known for writing, directing and starring as the Dame in one of Britain's most admired traditional annual pantomimes, at the York Theatre Royal. Nightbirds will we released on UK dual format (DVD and Blu-ray) on28th May 2012 as part of the BFI's Flipside label at the RRP of £19.99. Extensive illustrated booklet with newly-commissioned essays by filmmaker Nicolas Winding Refn, Milligan biographer Jimmy McDonough and film experts Stephen Thrower and Tim Lucas.